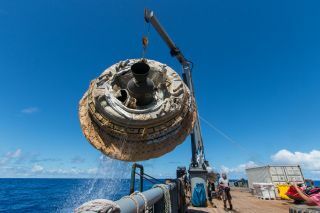 NASA's saucer-shaped Low-Density Supersonic Decelerator test vehicle is lifted aboard Kahana recovery ship after its June 28, 2014 test flight over the U.S. Navy's Pacific Missile Range. This story was updated at 6:30 p.m. EDT on June 29. New NASA gear that could help humanity set up an outpost on Mars has gotten its first test flight. The space agency launched its Low-Density Supersonic Decelerator (LDSD) test vehicle Saturday (June 28) from Hawaii. Although the first part of the test went well, the vehicle's huge parachute apparently failed to deploy properly — but LDSD engineers are pleased anyway. Saturday's test — which lifted off from the U.S. Navy's Pacific Missile Range Facility on the island of Kauai at 2:45 p.m. EDT (1845 GMT; 8:45 a.m. local Hawaii time) — was designed to help NASA engineers get their first good look at how equipment designed to slow the descent of heavy spacecraft through the Red Planet's atmosphere performs at high speeds in Mars-like conditions. The flight was originally scheduled for June 3, but poor weather conditions pushed it back multiple times, causing a delay of nearly a month. The LDSD project is developing and testing a 100-foot-wide (30.5 meters) parachute — the biggest supersonic chute ever flown — and two saucer-like devices called Supersonic Inflatable Aerodynamic Decelerators, or SIADs. One SIAD is 20 feet (6 m) wide, while the other measures 26 feet (8 m) across. Both devices are built to fit around the rim of atmospheric entry vehicles like the one that carried NASA's Mars rover Curiosity in August 2012, slowing them down by increasing their drag. During Saturday's test, a huge balloon carried the 7,000-lb. (3,175 kilograms) test vehicle, which was equipped with the big chute and the 20-foot SIAD, up to an altitude of 23 miles (37 kilometers). The balloon dropped the craft at that point, and its onboard rocket motor kicked on, boosting it to Mach 4 (four times the speed of sound) and 34 miles up (55 km) if all went according to plan. The thin air at such heights is a good analog for the Martian atmosphere, which is just 1 percent as dense as that of Earth at sea level, researchers said. If the test had gone perfectly, the SIAD would have inflated and slowed the test vehicle down to Mach 2.5, at which point the chute would have deployed and taken the craft down to a soft splashdown in the Pacific Ocean. But things did not go perfectly. The balloon dropped the test vehicle at 5:05 p.m. EDT (2105 GMT), and the rocket appeared to fire properly. The SIAD seemed to inflate as planned, but data indicate that the parachute didn't deploy correctly, officials said. More information will become available later, after engineers have had a chance to analyze data from the test. The LDSD vehicle splashed down in the Pacific Ocean at 5:35 p.m. EDT (2135 GMT), NASA officials said. The craft and the big parachute were retrieved later Saturday by a recovery boat. At 1 ton, the SUV-size Curiosity rover is the biggest spacecraft ever to touch down on Mars. The robot landed softly thanks to a bold and complicated scheme that involved a 51-foot-wide (15.5 m) parachute and a rocket-powered sky crane, which lowered Curiosity down to the surface on cables. The sky crane can (and probably will) be used again to put payloads down on Mars. But new gear such as bigger chutes and SIADs will likely have to be included to slow really heavy stuff down enough for the sky crane to finish the job, Clark said. And that's where the LDSD project comes in. "With the science and the technologies that we're testing here, we think we could double the mass that we land on Mars, which would go from something like the 1-ton Curiosity rover to something twice that," Clark told reporters during a pre-launch briefing in early June, adding that the gear could also help put payloads down more accurately and at higher elevations on the Red Planet than is currently possible. The LDSD technologies should also be extensible, Clark said. For example, multiple 100-foot-wide chutes could work together, helping put human-scale payloads — such as habitat modules and other big pieces of infrastructure — down on Mars. "We think that the parachute we're developing and testing is amenable to being used in clusters," Clark said. "Several parachutes at once create even more drag, and those kinds of things are the technologies that would enable the 20 to 30 tons that we're talking about." The next stop for the LDSD gear will not be Mars, however. NASA plans at least two more flight tests out of Hawaii, both of which will likely happen in 2015.